A beautiful product that solves a problem no one has will fail. An ugly product that solves a real problem well can succeed. There has been a fantastic response to the post on the Dribbblisation of Design, many people agreeing with the premise and adding to it, some disagreeing and offering counter points. I want to respond to people’s commentary, explain the original motivation for the post which wasn’t about Dribbble specifically, and talk about how we hire designers. For years the importance of great design in software development was underestimated and misunderstood. Designers the world over lamented that their colleagues in Product Management and Engineering were asking them for a visual treatment of something already defined. They mockingly referred to themselves as “Photoshop monkeys”. Designers in the “Photoshop monkey” role were always looking out for a new team, a new job. They knew this wasn’t what design was about. Slowly but surely, software companies realised that design led companies were outperforming competitors, Apple being the most obvious and most profitable example. The aggregate results of this vicious cycle moves our craft backwards because it perpetuates a misunderstanding of design, the myth that design is primarily about aesthetics. So visual designers are hired by these recruiters, expecting them to be great product designers, setting everyone up to fail. The intended outcome of the design work. The design of the required components. I believe that none of these layers exist independently. The best designers understand all four layers, and that the best visual designers understand how to design fantastic interactions. In my experience the best designers I have worked with were brilliant at one or two of these layers, and very, very good at the others. With the ability to design on different layers, the sum is far greater than the individual parts. 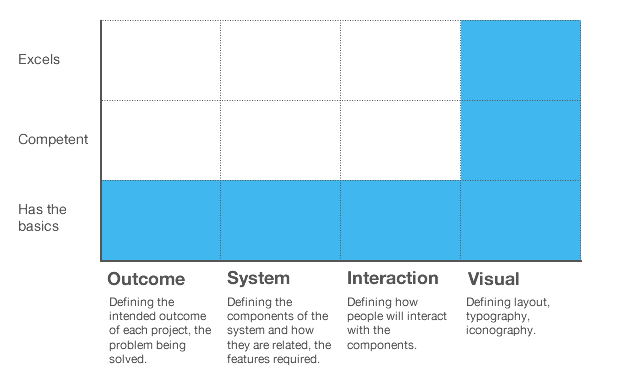 Visual design is intertwined with the design of the interactions. Loops, state changes, changes in data. This is not print design. How something looks should be serving how it works. If you’re a visual designer who wants to better understand the interaction layer, I highly recommend Dan Saffer’s book Microinteractions. Some commenters put forward that visual design is the primary thing that draws people in and is therefore the most important layer. This is not how I think about it. 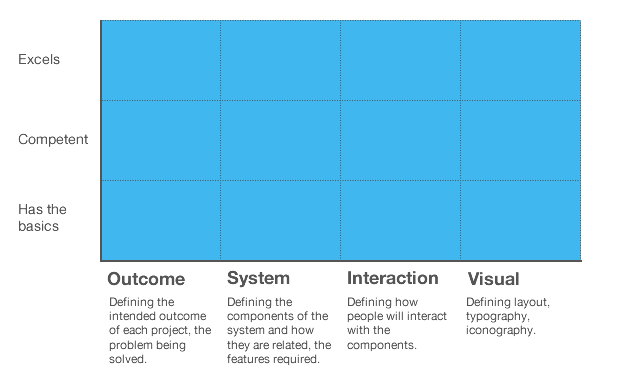 Visual design is certainly incredibly important, but people are also drawn to something with a promise of value – what the product is, what value it could deliver – in other words the work of the higher level design layers. Time and again we have witnessed ugly looking products succeed (for example Craigslist), and beautiful looking products fail (for example Color). Things that look good may draw people in, but those people won’t stick around when things are poorly designed beyond the visual layer. All the layers are critically important. Finally let’s talk about Dribbble specifically. The first post wasn’t an attack on Dribbble as a product (and I would love Dan and his team to offer their opinion on what they are building), it was the broader themes that mattered. 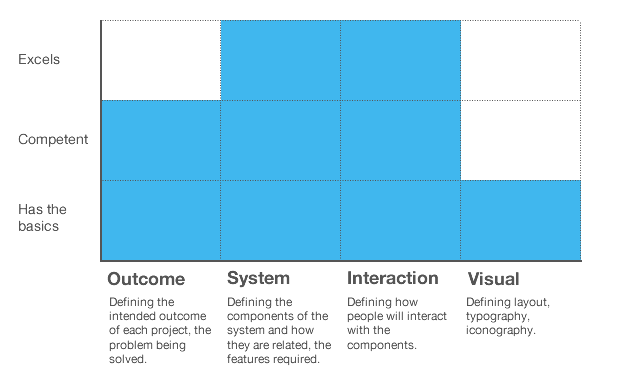 It is the vicious cycle of misunderstanding design that needs to be broken. Regarding the reaction from people supporting Dribbble, the main point for me is that Dribbble isn’t what people say it is, it’s what people use it for. As anyone who builds a platform for expression knows, you cannot predict how people will use it. The platform then reacts, adapts, evolves. People say Dribbble is “a showcase site”, “a show and tell”, “a Twitter for designers”, “a place to design things so you don’t have to worry about real world constraints”. None of these explanations make much sense to me. If it is about showing ongoing work and brevity, then I’d expect to see a lot more rough work, sketches, half baked things. Yet most things on Dribbble are pixel perfect executions. If it is about visual inspiration, then that’s great but that’s more art than design, and certainly not a primary place to find great designers. Great art workers, great graphic artists, certainly. But not designers. The best reasoning I saw was that Dribbble was like an advert, as a way to drive recruiters to your website – which shows your thinking, your sketches, your process. There is certainly some fantastic designers on Dribbble, and examples of work on Dribbble that focuses on non visual design layers, (thanks for the examples DC Townson and Alex). But they are the exception. In most cases, a popular Dribbble portfolio is simply evidence that you are expert with graphics software, that you understand current visual design trends, and in some cases that you are good at one of the four layers of design. But there is no causality between Dribbble popularity and shipping great design work. I don’t care so much about Dribbble, or any one portfolio site. I care most about breaking the cycle. I worry that young designers don’t get exposure to the true power of great design. I care that these same young designers aren’t hired into a job that is set up for them to fail, that they don’t unknowingly design products no-one wants, or interactions no-one understands. I care that the companies who invest in design don’t fail because they misunderstood what they needed. This is about design education, and above all else, the idea that design is fundamentally about how something works, not how it looks.